Need a fun excuse to get friends together around the holidays? We’ve rounded up eight of the most popular Christmas party ideas to inspire your holiday entertaining. From affordable holiday party invitations to decorating ideas, we take you through simple steps to pull off each party idea with flair! Let’s take a look! A Christmas cocktail party is fun excuse to get dressed up and have friends over for drinks. If you’d like your friends to show up in cocktail attire or if your party will be black tie and upscale, make sure to mention the dress code in your invitations. The idea is to serve one or more holiday-themed drinks alongside classic cocktails like martinis, Manhattans, whiskey sours, and jack and coke. Take the presentation of your drinks to the next level by using cranberries, candy canes, or cinnamon sticks as garnishes. Candy canes are beautiful garnishes for Christmas cocktails. Make sure you have plenty of salty appetizers for guests to munch while they enjoy drinks, like savory cocktail meatballs, prosciutto and goat cheese crostini, or holiday spiced nuts. Ugly Christmas sweater parties hit the scene about 10 years ago and they’ve only gained in popularity ever since. The concept is simple: guests show up in the most hideous holiday sweater they can find. The more outlandish the sweater, the better. Motivate your guests to go all out by offering a cash prize to the person wearing the tackiest outfit. Be sure to include this little tidbit on your invites so people can begin planning their outfits. To make your ugly sweater party memorable, consider some themed food, like a cake that you’ve frosted to look like a sweater. Also, don’t skimp on the decorations! Visit your local thrift store for some Christmas sweaters that you can incorporate into your decor, either as garlands or draped across your dessert table as runners. Bake an ugly sweater themed cake for your guests! A white elephant gift exchange, sometimes called a Yankee swap, is a party where each guest brings a wrapped present that is under a dollar amount stated in the invitations. Guests often bring quirky and silly gifts, like a toilet-shaped coffee mug, but some guests bring desirable gifts, like a Starbucks gift card or a bestselling book. During the white elephant gift exchange, guests gather in a circle around the gift pile. After the first person opens a gift, the second person has the option to either steal the gift the first person opened or choose an unopened gift from the pile. The third person then has the option to steal either of the first two people’s gifts or select one of his own, and so on and so forth. Hilarious antics ensue as the best gifts get stolen and people try to avoid the sillier gifts. At a cookie swap party, every guest is expected to bring several batches of their favorite fresh baked Christmas cookies to swap with other guests. Each guest then gets to take home an assortment of homemade Christmas cookies to enjoy throughout the holiday season. It’s a brilliant way to simplify your holiday baking while mingling with good company! 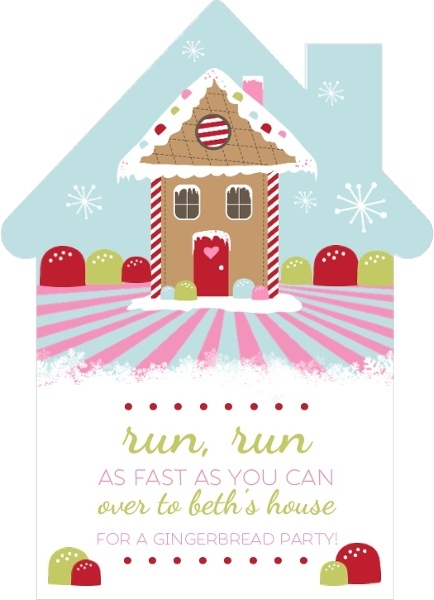 On your cookie swap invitations, encourage guests to bring a copy of their recipe to share. Aside from traditional cut-out sugar cookies, guests can bring other holiday favorites like gingerbread cookies, shortbread cookies, and peanut butter kiss cookies. A cookie swap is a great way to trade and taste a variety of Christmas cookies. If you’re up for a little friendly competition, you can even hold a blind vote to determine who baked the best-tasting cookies. Shiny new baking utensils would make an excellent prize for this type of competition! At an ornament exchange party, all guests are asked to bring a Christmas ornament within a certain price point (less than $10 is a common amount). Each ornament is then placed on a bare, miniature Christmas tree and assigned a number. When it’s time for the exchange, each guest draws a number from a bowl and takes home the ornament that corresponds with the number. To help make your ornament exchange more fun, set up a craft station where guests can make their own DIY ornaments. Provide instructions and craft supplies, such as Popsicle sticks, holiday fabric, yarn, buttons, etc. and enjoy making your own ornament creations with family and friends. Gift wrapping parties bring family and friends together for both merriment and practical purposes. You can get all your gift wrapping out of the way in one fell swoop while enjoying some good food and good company. The host provides most of the necessary gift wrapping materials, such as wrapping paper, ribbon, bows, and gift tags. However, you can request that guests bring one roll of wrapping paper to share so that everyone’s gifts can be wrapped uniquely. Wrap presents while mingling with friends at a gift wrapping party. Nothing gets you in the Christmas spirit like an incredible, edible gingerbread house! Building them is half the fun; eating them is the other half! In your invitations, let guests know whether you will be providing materials for making the gingerbread houses or if guests should bring their own materials. Encourage a little friendly competition by including a blind vote where guests can weigh in on which gingerbread house is the best. Typical gingerbread house materials include gingerbread or graham crackers, royal frosting and piping bags, pretzel sticks, chocolate rocks, peppermints, and a variety of brightly colored candies, like gumdrops, jelly beans, and licorice laces. 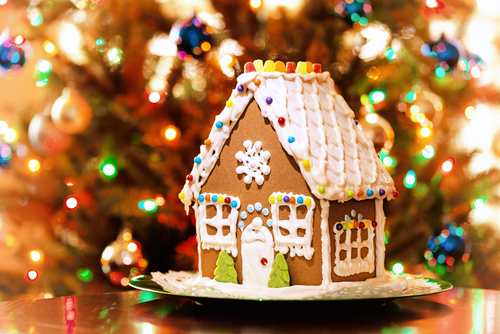 A gingerbread house making party is a great way to have a little friendly competition. Make sure the workspace is covered in plastic to protect your tabletop and carpet, and keep materials organized with a variety of bowls or with a simple muffin tin. 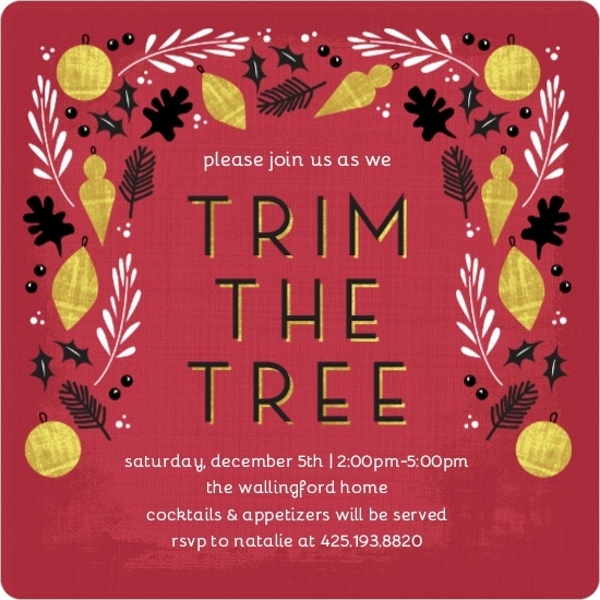 Last but not least, a tree trimming party is a great way to gather friends to help you decorate your Christmas tree. Set the mood with festive Christmas music. Be sure to provide some holiday treats, like spiked eggnog, hearty chili, shrimp cocktail, and a chocolate trifle for guests to enjoy while outfitting the tree with lights, tinsel, candy canes, and ornaments. Keep the kids busy creating popcorn garlands or simple construction paper chains that they can either use to decorate the tree or take home to enjoy on their own trees. Choose the youngest guest in attendance to top the tree with its crowning adornment — a shining star or glowing angel.